To set you apart from your competitors, we research your needs, your target audience,the image you need to convey, and then create the unique design for your project! DG Management & Consultants, needed a new logo concept to off set them from their competitors. With the plethora of management and consulting firms flooding the market, my client wanted his firm to be the paradyme in this field. An attractive card like this tells his clients that because he wanted a quality representation of himself, that he was willing to give them the same quality. Electric Vehicle Infrastructure, Inc., wanted a striking yet conservative image for their clients (Ford, Honda, Chrysler, Dodge, and Toyota). 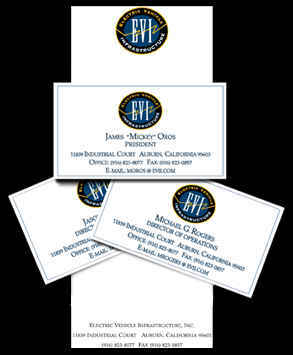 The "EVI" was embossed and the out put resolution for the cards and letterhead was 2400 dpi. 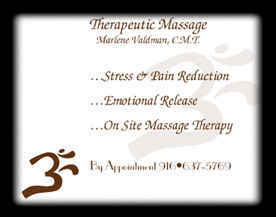 Marlene, a therapeutic massage specialist wanted a tent card on her reception desk. The card has design elements and text on both sides. When someone picks up the card and puts it down, who ever sees the card next, will be attracted to reading the information. If there was nothing on the other side, she may lose a potential client, because all that faces the viewer, is a "blank" card. 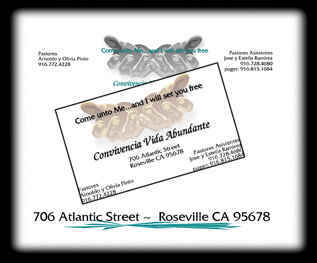 The Spanish Speaking church, Convivencia Vida Abundante, wanted to convey the out stretched hand of help and hope to those who entered their door. Our clients received the design elements that conveyed the image they wanted to project to their prospective customers and have come back for future projects. If we can be of assistance to your future design projects, please visit our contact page to reach us by phone, fax or email.